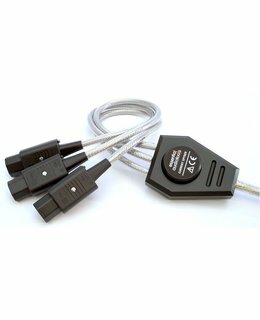 These three cables have a length of 20, 30 and 40cm (or three times 40cm), so if you have a stacked set of equipment the Current Spyder will hang down without taking a lot of space behind your set. The result: reduced cable mess and a much better performance. The Current Spyder (on purpose with y, just because we like it) is equipped with a Pulse Protector to protect your valuable system. 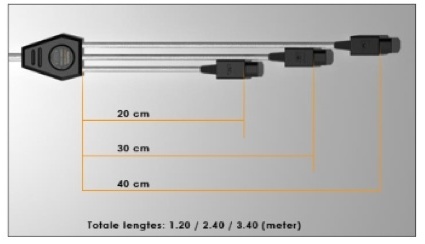 The primary cable is available in two lengths, 75 and 150cm. So when ordering a Current Spyder you can choose from four types. Without noticing we are in a very polluted environment. Everywhere around us fields arise from currents flowing through conductors. Also interference pulses are not visible to us, but they just are there. Each device using energy causes fluctuations on the network in the form of peaks or surges, or causes a variation in the fields in the air. The effects occur around the device itself and on its mains supply, but even far away from the device the fields are still measurable. This can only be measured with suitable equipment, not with our ears. Common thought is that shielded power cords protect the connected devices better against influences from outside, and that is true. But much more important is that the field created by the fluctuating current inside the power cord does not reach interlinks in the neighbourhood. Interlinks transport small signals to devices with a high input resistance, this makes the signals extremely sensitive for interfering fields. 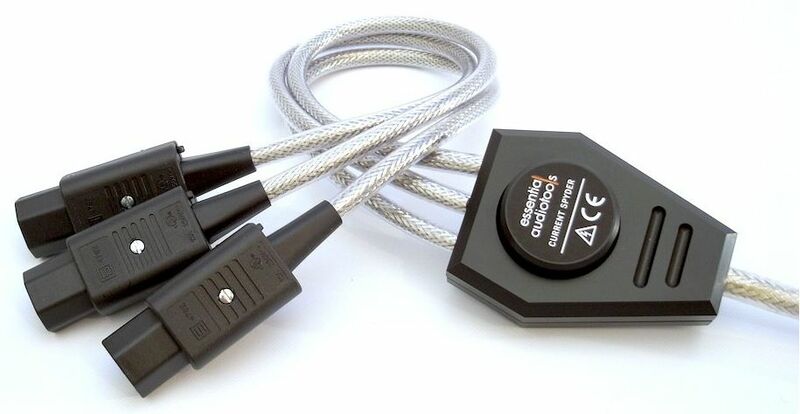 Many power cords for audio look beautiful , just like ours. But appearance is not all! The Current Conductor is a dual shielded cable. The outside shield is NOT a braided steel one, a steel screening does not function as a shield, it is meant to protect the cable against physical force. Instead, the Current Conductor has a braided copper screen with high density and tin protection against oxidation. Under the copper shielding lies a 100% closed aluminum foil for suppression of high frequencies. In contradiction to a synthetic foil, this solution works! The three stranded wires are suitable to conduct high currents without resistive losses (the losses of energy in the form of heat). The earth wire is connected at both sides, the shield is only connected at the feeding side, as it is supposed to be. Finally, we gave the plug a nice CNC machined cover. 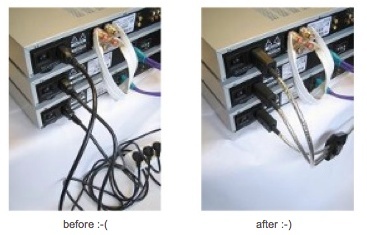 The Current Spyder not only makes audio sets perform better, it also reduces the visible mess. The relationship with your life-partner will become much better. Probably you can give hints to have this for your birthday! The Current Spyder is designed to feed audio equipment standing on top of each other. Thus the Spyder will hang down and disappear behind the set while lowering the external fields.